I thought I would share a little bit more from the book I reviewed, “VirtualBox 3.1 Beginners Guide“. This book outlines the process of installing Guest Additions on your virtual machines. Guest additions allow you to greatly improve your experience when working inside virtual machines. Improved mouse and keyboard integration, improved video resolution and more! VirtualBox Guest Additions are a basic requirement for anyone wanting to properly run virtual machines in a graphical environment. 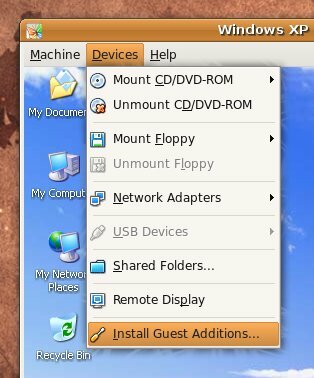 In this article I will outline how to install VirtualBox Guest Additions on Windows and Linux virtual machines. If you have not previously run a Virtual Machine with Guest Additions, you’ve been missing out! This article assumes, of course, that you already have VirtualBox and a Virtual Machine installed. You’ll find instructions below for both Windows and Linux guests. In the VirtualBox menu of your running Virtual Machine, under Devices, select “Install Guest Additions”. Follow the prompts for the VirtualBox Guest Additions Setup. Reboot the Virtual Machine when prompted. You can always verify whether or not VirtualBox Guest Additions are installed in your Virtual Machine by looking in the system tray. If you see a small VirtualBox icon, VirtualBox Guest additions is installed an running properly. These instructions should apply to most Linux distributions. It is not limited to Ubuntu Virtual Machines. Ensure you have the ‘build-essential’ and ‘dkms’ packages installed in the Virtual Machine. This is required to compile the kernel modules required. This may prompt you with an auto-run prompt as it loads the CD image. You can skip this as you’ll need to run the installer from the Terminal. Open a Terminal and navigate to the VBOX* directory under /media. If everything runs according to plan, you’ll be prompted to reboot your Virtual Machine. * Note: step 5 allows for 32bit or 64bit installations. If your Virtual Machine is a 64bit, run the ./VboxLinuxAdditions-amd64.run instead. You can always verify whether or not VirtualBox Guest Additions are installed in your Virtual Machine by looking in the system tray. If you see a small VirtualBox icon, VirtualBox Guest additions is installed and running properly. After installing VirtualBox Guest Additions you’ll notice a great improvement in your Virtual Machine experience. You’ll have much better mouse and keyboard integration, improved video resolution, the ability to run in Full Screen and Seamless Window Integration, and much more. VirtualBox Guest Additions are required for anyone regularly running Virtual Machines, whether Windows or Linux. Note: I found this for those wishing to install VirtualBox Guest Additions on Fedora. For Ubuntu 10.04, you can use Synaptic to install packages virtualbox-ose-guest-dkms, virtualbox-ose-guest-dkms, virtualbox-ose-guest-x11 and virtualbox-ose-guest-utils. It might be better to use these packages instead: maybe then you can easily uninstall the guest additions and maybe then the guest additions survive kernel updates (I haven’t tried myself). I installed the guest additions for VirtualBox 3.2.8 the way described in this article but I ran into problems: I cannot connect to the machine using SSH anymore and when accessing my Windows desktop where VirtualBox is running over Remote Desktop I have keyboard problems (Ubuntu often takes my keystroke as multiple keystrokes). So now I’m wondering how to uninstall the guest additions. Do you have any idea why USB drives suddenly are not mountable in virtualbox, although I do have included myself in vboxusers group? Also, just to let you know, with my ‘WinXP host’ / ‘Ubuntu Desktop LSE Lucid Lynx Guest’ I could not work out how to use that run command. In the end I just right clicked on the VBOXADDITIONS* icon on the desktop. Where is the system tray located in Ubuntu? I can’t seem to find the answer in the docs. and i can’t see a Virtual box logo anywhere. Hm… this screen show up for you too? I dont see any point in guestAddition be stored in other website.